From January 14, 2019, TYM will expand its beneficiaries of policy loan. Specifically, women with disabilities, HIV infection or husbands and children infected with HIV can apply for this policy loan. 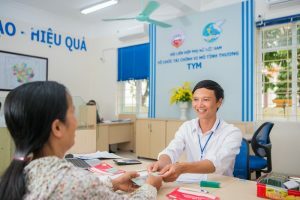 Implementing the mission of “Improving the quality of life of low-income individuals and households, especially giving priority to poor and vulnerable women…” TYM has been implementing policy loan product for many years with simple procedures, preferential interest rates for poor households as stipulated by the Government. This loan product has always been favored by local people and authorities. In order for the loan product to support more vulnerable women, from January 14, 2019, TYM will expand its beneficiaries of policy loan. Specifically, women with disabilities, HIV infection or husbands and children infected with HIV can apply for this policy loan. TYM hopes that this change will help weak women bravely borrow money, and gradually start and develop their businesses. This is also an action of TYM to contribute to the Prime Minister’s appeal “No one is left behind”. For more information about the product, please refer to this link. Starting the opening session of the ASEAN Women’s Ministers’ Meeting, taking place in the afternoon of October 25, 2018, Prime Minister Nguyen Xuan Phuc asked: “I wonder if we can successfully implement the ASEAN 2025 vision if we as women and girls are not guaranteed equal opportunities and are left behind? I believe that you and I have the same answer, that we cannot become an ASEAN community of solidarity, self-reliance, creativity, sustainable development without the important participation of women and children”, the Prime Minister said. Commencing the opening session of the ASEAN Women’s Ministers’ Meeting, taking place in the afternoon of October 25, 2018, Prime Minister Nguyen Xuan Phuc asked: “I wonder if we can successfully implement the ASEAN 2025 vision if we as women and girls are not guaranteed equal opportunities and are left behind? I believe that you and I have the same answer, that we cannot become an ASEAN community of solidarity, self-reliance, creativity, sustainable development without the important participation of women and children “, the Prime Minister said.